Umbrellas have been around for thousands of years. In fact they were invented to shield the Pharaohs from the sun, not the rain. Which is to say, they were a symbol of wealth and power. Two thousand years later, the umbrella had become an object meant to protect you from the rain, and if you’re a character in a Dickens novel and you have one, it’s because you’re too poor to own a carriage — which is to say, it’s a sign of poverty. It’s gone back and forth between other social connotations, too — is it a woman’s style object, or symbol of a businessman’s power? In between are two millennia of invention and refinement, from heavy whale bone to feather-light aluminium, and of inspired literature (the umbrella appears over 350 times in Dickens), philosophy (Derrida and Nietzsche both wrote about umbrellas), film-making (think Mary Poppins, or The Umbrellas of Cherbourg) and both Western and Eastern art. 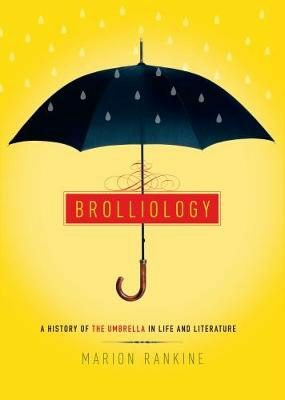 In Brolliology — an actual word, by the way, meaning the study of umbrellas — Marion Rankine covers all that and more, with lavish illustrations, helping us to realise our deep connection to this most forgettable everyday object — which we only truly appreciate when we don’t have one. Author biog: Marion Rankine is a London-based writer and bookseller. Her work has appeared in the Times Literary Supplement, the Guardian, Overland, For Books’ Sake, and elsewhere. Brolliology is her first book.